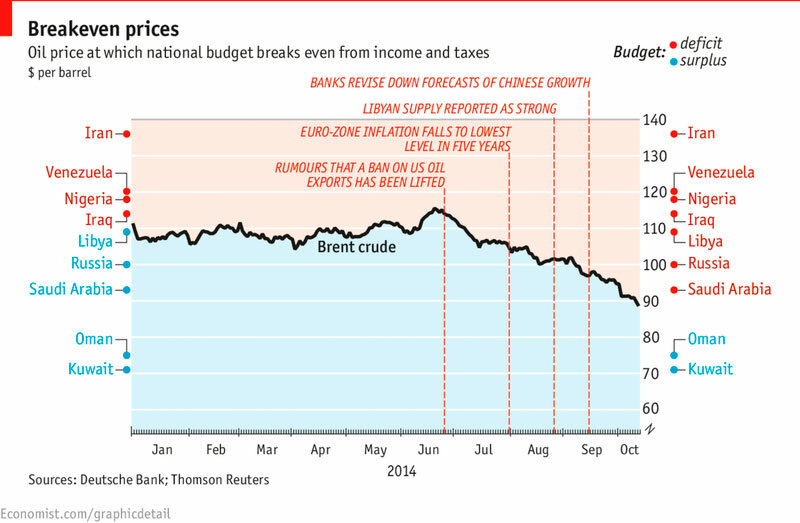 Playing with oil prices: a global strategic sport? Oil prices have been recently falling; many commentators wonder why. After all, this is quite a surprise, if we consider the current turbulences in oil-rich Middle East. One possible explanation is the global slowdown of the world economy; after all, China’s growth is by now in the region of 7-8%, clearly less than the 11-12% it recorded just few years ago; India, too, has slowed down; the two giants together represent more than 2.5 billion people and of course have a huge impact on the global demand. Another explanation points to USA investment in shale energy. While it is true that USA shale oil extraction has risen by 53% in the years 2008-13, and the States might become the world’s largest oil producer in 2014, it is also true that this boom might not last long. Drilling costs are high and in 2013 USA domestic production still covered only 55% of its overall consumption. In other words, the shale oil boom might remain a temporary phenomenon. Leaving aside American shale, what has surprised the markets has mainly been Saudi Arabia’s choice to cut oil prices, as announced on October 1 (Wall Street Journal, 1 October) and followed by further cuts in other Gulf countries. What is happening in the Kingdom, which is a key US ally, a G-20 economy, and the main OPEC oil producer? Is the cut a move to offset competitors, including ailing Venezuela, Iran, and potentially Russia? Is it a reaction against the USA itself (shale oil is in general more expensive and the USA might stop drilling at a lower price)? We think that ‘the cut’ is first and foremost a move dictated by economic considerations; in particular, by the intention to gain bigger market shares in Asia (China, India, and Japan) and even Europe (Financial Times, 20 October). Saudi Arabia wants to avoid repeating the mistake of the early 1980s, when it massively cut production in a move which turned beneficial to other OPEC and non-OPEC countries and led to decline and recession in the Kingdom. Cutting prices can be seen as a pre-emptive strategy to foster oil demand. Yet in a broader sense, Riyadh’s move is a sign of difficulties and weakness. Saudi prince Alwaleed, a famous billionaire with worldwide economic interests, defined lower oil prices ‘a catastrophe’ to his country’s economy (Financial Times, 14 October). What might he mean? While guessing Alwaleed’s intentions remains a game for magicians, Saudi Arabia’s present and potential troubles are quite clear. The Wahhabi monarchy has traditional adversaries (Iran above all) but might have also lost some trust in its traditional ally, the USA, after the latter contributed to the ‘Arab Spring’ (let us not forget Saudi Arabia is an absolute monarchy and of course is wary of liberal advancements in the region) but later did not intervene in Syria. Now the USA’s partial reapproachment with Iran against the ISIL might have further upset the Saudi authorities. Problems pile up both inside (a growing middle class might pose a challenge to Riyadh’s often draconian legislation) and at the borders (neighbouring Yemen is currently falling to the Houthis, a Shia group close to Tehran). One year ago (18 October) Saudi Arabia rejected a seat in the UN Security Council in a protest over US inaction in Syria; a year later, cutting oil prices sends a similar signal: Riyadh feels isolated and somehow ‘neglected’ by Washington and is perhaps looking for new partners and markets – mainly in Asia. As a matter of fact, oil prices are slumping to the region of 80-85$/barrel, and at the moment, China is already Saudi Arabia’s major trade partner. Will Riyadh’s choices affect Russia – and in what ways? Of course lower oil prices will affect the Russian economy, but current problems can also be turned into opportunities. So far sanctions have hit an already beleaguered EU harder than Russia: with an oil price of 90$/barrel, Russia’s budget deficit in 2015 would be 1.2%; in the UK at the moment it is estimated at 5.80%; in France, 4.20%; interestingly, both London and Paris are often vocal in criticising budget mismanagement…in other countries! In addition, a falling rouble could also help Russian exports towards other world regions. Russia and Iran are determined to establish a joint bank (Xinhua, 11 October), and co-operation with China is thriving. In the recent (13 September) inter-ministerial meeting in Moscow, China and Russia have signed more than forty agreements, ranging from agriculture to defence, high-speed railways to energy. The two States also signed a 24.4 billion$ currency swap deal. In other words, also thanks to the BRICS group, Russia has other opportunities for trade and access to credit; leaving aside the fact that Western sanctions might also induce Russia to ‘refurbish’ its economic system in an autonomous way, and more strongly rely on domestic forces. Yet Russia and the European Union need each other, and the current stalemate is politically unfortunate and economically problematic – particularly for an EU which is already facing tremendous domestic issues. As early as 7 August, the German Committee on Eastern European Economic Relations warned that 25,000 jobs in Germany would be at risk because of the new wave of sanctions (Reuters, 7 August). Now we know that the three major Eurozone economies are either in recession (Italy and probably Germany) or constantly stagnating (France). All three have important economic ties with Russia, in a range of sectors from agriculture to car making. Some smaller EU countries have openly criticised the sanctions regime and attempted some overture; among them, we can mention Slovakia, Hungary, and the Czech Republic. President Putin also held talks with Austria’s Chancellor Faymann (Swissinfo, 19 September); Vienna after all can boast a highly credible tradition in diplomacy and international dialogue. Yet dialogue should not remain an Austrian prerogative. EU and Russian economic problems will be addressed only if the EU as a whole, with the support of its larger Eurozone economies (Germany, France, Italy), will open a firm and genuine dialogue with Russia. The current European Union, which is represented by a weak set of institutions and is over dependent on the USA, is hardly credible. Only a strong and more autonomous EU will be fully aware of the importance of its relations with Russia in the energy sector as well as in other areas – security, trade, culture, and so on.